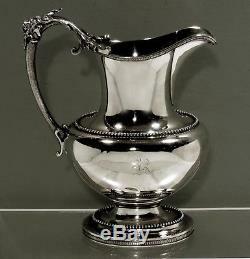 GORHAM SILVER PITCHER c1859 " SAME HALLMARK AS LINCOLN TEA SET - SMITHSONIAN ". 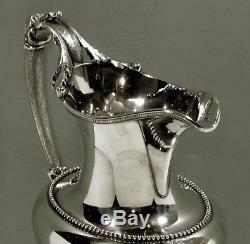 An important c1859 Gorham lion handle cream jug. 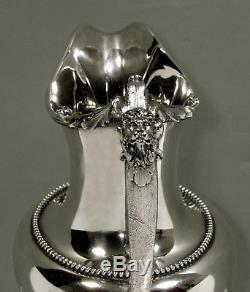 Displays the same lion head handles and same hallmark as. The tea set presented to Mrs. Lincoln when President Lincoln was in the White House. The Lincoln service displayed in the Smithsonian Institute. See page 44 in Carpenter's Gorham text. Raised oval form with beaded shoulder and base. Scrolling interwoven disc border to rim and edge of the stepped base. Lion mask center rolling twig and palm leaf handle. 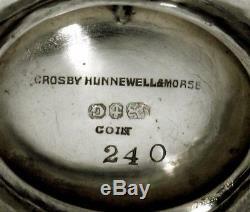 Identical to those found on the Lincoln tea service. Gothic JRN one side and R the other. 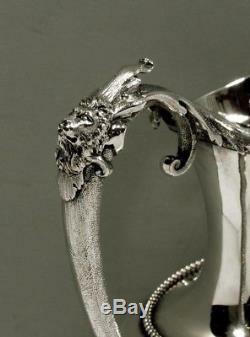 This c1859 Gorham silver lion cream jug. 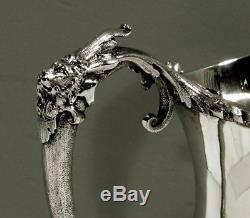 Is 7 1/2 inches to top handle and 14 standard ounces. The Gorham hallmarks, with lion facing left and "COIN". The identical hallmark of the President Lincoln tea service. Which is displayed in the SMITHSONIAN. 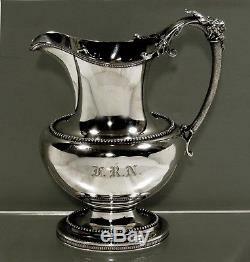 The item "Gorham Silver Pitcher c1859 SAME HALLMARK LINCOLN TEA SET SMITHSONIAN" is in sale since Wednesday, September 19, 2018.